Well, Hugo Chávez is dead and buried. This fact thrills the hell out of some people, who hated his bombastic style and anti-American rhetoric, and disappoints others, who saw Chávez in the David role against the Goliath of "American imperialism." 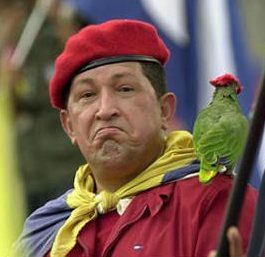 Be that as it may, I think we can all agree that Chávez was quite a peculiar character. So it should come as no surprise that we now have claims that (1) he was killed by the Illuminati, and (2) that aliens came to his funeral. Yup. Poor Chávez didn't die of ordinary liver cancer; he died of "weaponized cancer," and was killed by "by a special Satellite Weapon designed to deliver a wave of Radio Active [sic] Signal to the Body which delievers [sic] Tumors to the Body." (Source) Chávez was a hero, the author says, who was taken out because he "knew too much" and because he was standing up against the "New World Order." What exactly Chávez "knew" is open to question. He certainly seemed to have limited knowledge about Mars, for example. As far as his standing up against the "New World Order," whatever the hell that actually is, it seems like mostly who he stood up to was George W. Bush (whom he referred to variously as a "birdie," a "donkey," and "the devil"). And, honestly, I can't fault him for that. I'm not a particularly political person, but I have to admit to having questioned GWB's morals, ethics, and IQ on numerous occasions myself. Other than that, Chávez seems to have been a bit of a rambling nutjob, but certainly not as bad as Mahmoud Ahmadinejad or Kim Jong Un in the Dangerous Wacko Department. 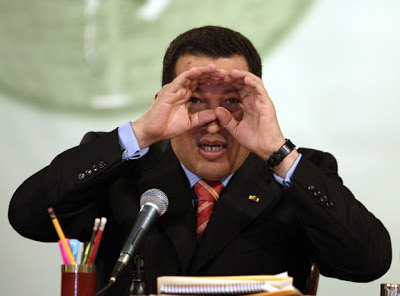 If the Illuminati are beaming tumors into world leaders, Chávez seems like an odd place to start. What? You don't find that convincing? Just because we need a great big arrow even to see where the spaceship is in the photograph? Just because it could be damn near anything, from a fleck of dust on the camera lens to a distant pigeon? 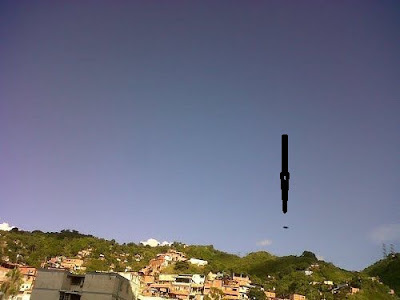 Just because if there really had been a spaceship, hovering over a heavily populated part of Caracas in broad daylight, someone would have seen it and gotten a better shot of it? So, okay, maybe not. But you have to admit that if anyone deserved having aliens pay their respects, it was Chávez. Even if he wasn't right about life on Mars being wiped out by capitalism, and he wasn't done in by Death Rays From Space, he still was strange enough that his passing deserved some kind of spectacular gesture. Especially given that at the time, Lady Gaga was in a Top Secret Meeting with the other scaly-skinned non-human Reptilians (I hear they include Hillary Clinton, John Boehner, and Keith Richards, the last-mentioned of which I can hardly argue with), and so she couldn't make it down to say goodbye. So, anyway, farewell, Hugo. I may not have liked your politics much, but I have to admit that you were always impressive in the inadvertent humor department. And even if you died of a perfectly ordinary disease, and the aliens actually didn't show up for your funeral, you still were a colorful, memorable man, and in this strange and chaotic world, maybe that's the best you can hope for.